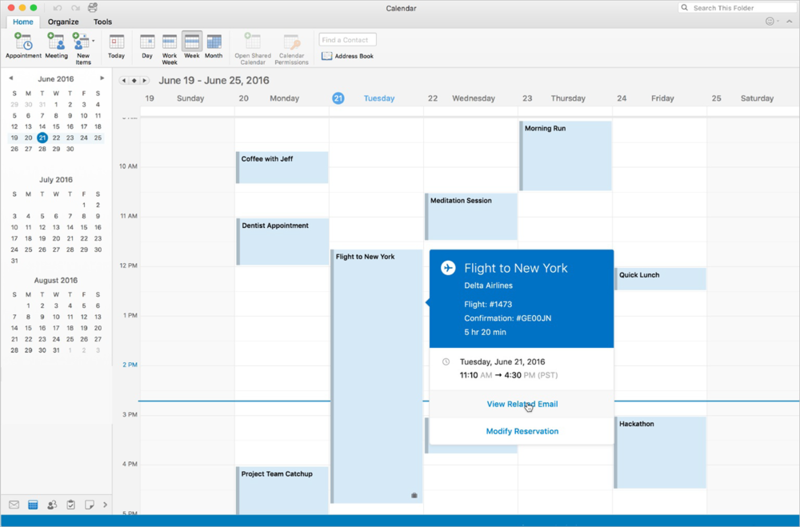 These features are rolling out to Outlook for Mac and Outlook on the web today and will soon be coming to Windows, iOS and Android, as well as the Windows 10 Mail and Calendar apps. Travel itinerary emails are complicated to read because they contain so much more than just your reservation. It especially gets complicated when the itinerary includes multiple flights, hotel reservations and rental car confirmations. Outlook now displays the most important information from travel itineraries and puts them in an easily readable summary on top of your email. In addition to helping you see your travel plans at a glance, the summary cards provide you with quick actions for the key things you need to do. No more hunting for the check-in link in a long confirmation email or trying to find where to change your hotel reservation. It’s now just a tap or click away in the summary card above the email to go directly to the provider’s specific web page for the action. 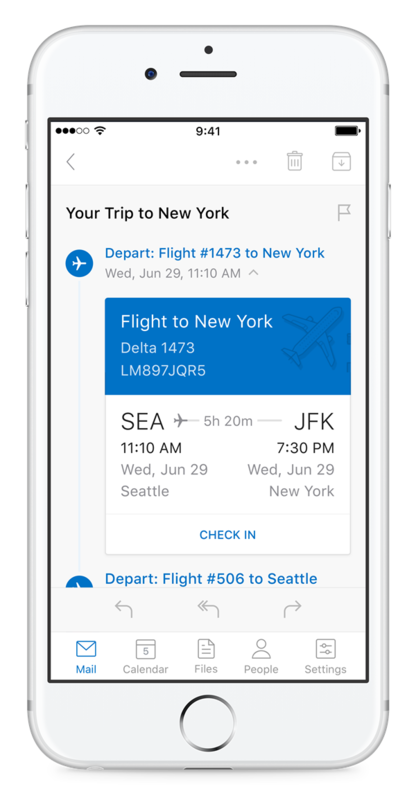 In addition to smarter email experiences, Outlook automatically adds travel events to your calendar with the same summary cards for each step of your trip detected in the reservations. The events include everything you need to know, such as date, time, locations, confirmation number and a few other key pieces of info you might need at your fingertips. You can go to the original booking email with a single click from the calendar event in case you need to look up more details. Travel updates and cancellations happen—for good or not so good reasons. Either way, Outlook automatically keeps the events on your calendar updated with new information from your travel provider. Timing is everything and it can mean the difference between getting the seat you want or settling for one you really don’t want. Not all airlines are great at notifying and reminding you when it’s time to check in for your flight. Outlook will always send you a reminder email exactly 24 hours in advance with a link to the airline’s check-in experience. What’s more, you can set an Uber ride reminder so you always get to airport on time. And three hours before your flight takes off, we’ll remind you again, so you can plan to be at the airport on time. And never miss package deliveries! We know travel is not the only thing you need to keep track of, so we are also adding package tracking experiences. When you receive a shipping confirmation email, we’ll summarize the most important info in a card above the email and automatically add an event to your calendar (for non-commercial accounts) to provide quick actions. We’re eager to hear your feedback and any suggestions that you’d like to see in Outlook. 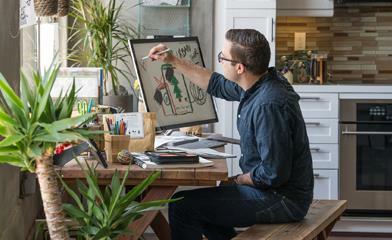 Joining the conversation on Outlook is easy—visit Outlook.UserVoice.com and sign in with your Microsoft account to leave your feedback. A. We’ve started the roll out in North America and will be expanding globally next. Some Outlook on the web and Outlook for Mac users will see these features today. If you don’t, you can expect to see them soon. Q. Which users have access to these features? A. These experiences will be available for users with Office 365 subscriptions that include Exchange Online and those users with new or upgraded Outlook.com accounts. Q. What do I need to do to start using these features? A. There is nothing you need to do. The features will automatically start working in your Office 365 account or your new Outlook.com account when you receive a travel reservation or package delivery email from a supported provider. Q. What settings are available for the automatic calendaring feature? A. In Outlook on the web, click the Settings (gear) icon, Options and then Calendar. The settings are in “Events from Email.” Changing the setting on the web will change all Outlook clients. Travel events are on by default for all account types. Package delivery events are on by default for Outlook.com accounts, but not for commercial accounts. A. Only if you want them to. The events are marked private by default, so the details will not be visible to someone with whom you shared your calendar. You can change the default in the Settings mentioned above.